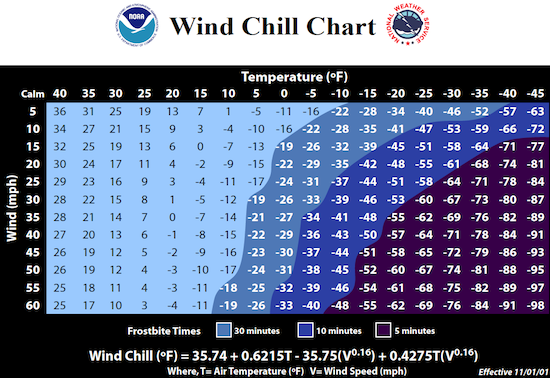 Paulding County currently is under a wind chill warning until 2 p.m. Thursday, Jan. 31. The warning, which started 1 p.m. Tuesday, means very cold air and strong winds combine to create wind chills as low as 45° below zero. Extreme cold temperatures are a big danger during winter months. Prolonged exposure to the cold can cause frostbite, hypothermia, or in extreme cases, death. In fact, excessive cold is one of the leading weather-related causes of death across the country. Infants and the elderly are most susceptible to extreme cold. Frostbite occurs when the skin becomes cold enough to actually freeze. A loss of feeling and a white or pale appearance in extremities, such as fingers, toes, ear lobes, or the nose are symptoms of frostbite. Hypothermia (Low Body Temperature) can occur during long periods of exposure when the body temperature drops below 95°. A person will become disoriented, confused, and shiver uncontrollably, eventually leading to drowsiness and apparent exhaustion. In severe cases, death is possible. Outside, dress in layers and limit exposure, Bohn said. Bohn said residents should take the weather conditions seriously. If power goes out, contact the EMA office at 419-399-3500 and they will find warm shelter. Bohn has a plan in place to implement if needed in case power is interrupted. Freezing temperatures also cause damage to crops and property. One of the biggest concerns is how extreme cold can impact homes and vehicles. Don’t forget to care for pets, especially those kept outside or in unheated garages or outbuildings. If not properly insulated, a home’s water lines can freeze. It is strongly recommended that homeowners have a steady stream of water running from faucets during a cold spell to reduce the potential that plumbing can freeze. Bohn advises anyone using auxiliary heating sources be extremely cautious due to fire risk. Space heaters should be placed in the middle of the room with at least 3 feet of clearance all the way around, not against or close to curtains, upholstery or anything that can catch fire. Make sure heaters are plugged into an outlet that is not overloaded and is rated for the amperage the heater needs. If a heater is plugged into an extension cord, make sure it is properly rated for that use. An extension cord can short out and catch fire. Bohn recommends that vehicle gas tanks are completely full – if you have less than half a tank, it increases the risk of fuel line freeze-up, which can occur while you’re on the road. Make sure your battery is fairly new; if not, that you have means of jumpstarting them if need to in the morning. “If you’re driving, have an emergency kit with blankets, stocking caps, gloves, and necessities if you’re stranded to properly protect yourself,” Bohn said. Residents should monitor media for weather updates and additional advisories. The dire cold won’t last, but the respite won’t last, either. Hypothermia is an unusually low body temperature. A temperature below 95° is an emergency. • Actions: Go to a warm room. Warm the center of the body first – chest, neck, head, and groin. Keep dry and wrapped up in warm blankets, including the head and neck. Fessel Jewelers Closed Thursday Jan. 31 This comment has been hidden due to low approval. Paulding county health department will be closed Thursday also This comment has been hidden due to low approval. Fessel Jewelers will be closed Wednesday Jan. 30 This comment has been hidden due to low approval.